Be the first to share your favorite memory, photo or story of Jeanette. This memorial page is dedicated for family, friends and future generations to celebrate the life of their loved one. Jeanette C. Beney, 86, died peacefully Saturday, January 12th following a brief illness. Mass of Christian Burial will be celebrated at 1:30 PM, Friday, January 18th at St. Mary’s Catholic Church with Father Steven Witt officiating. Burial will be at St. Joseph Cemetery. In lieu of flowers, memorials may be directed to the American Diabetes Association. Jeanette was born April 15, 1932 in Niagara Falls, New York, the daughter of Philip and Rose (Lovecchio) Novara. 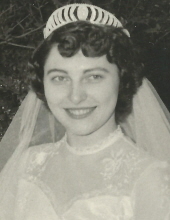 On May 28, 1955 Jeanette married Robert Beney in Niagara Falls. Jeanette was employed as a chemical lab technician in Niagara Falls prior to marriage in 1955 and continued to work as a lab tech until starting her own family about a year later. She was a brilliant chemist who very likely would have made her mark in science, but instead chose to make her mark in a more traditional path, that of a devoted and loving wife and mother. Jeanette was a lifelong Catholic and a member of St. Mary’s Church since moving to Iowa City in 1971. Jeanette grew up in a very tight-knit family in Niagara Falls, New York. She came to appreciate early in her life that 'family is everything'. Jeanette was eternally devoted to her family, and her family was paramount in her life. Jeanette was a wonderful wife and a most thoughtful and generous mother. Jeanette enjoyed time spent reading, cooking and doing word puzzles. She read mostly nonfiction and over the years the home was filled with the many books she'd read. Being the youngest in the family, Jeanette was never 'taught' how to cook. She learned to cook and bake by just watching her mother who cooked without using a recipe. Cooking intuitively with just the right combination of 'art' and 'science', everything she made was exceptional. Jeanette was kind and generous to everyone she met, and she will be dearly missed by all who knew her. Jeanette is survived by her five sons, David (Cindy), Dennis (Amy), Paul and Christopher, all of Iowa City and Thomas (Shukuan) of Seattle; three grandchildren, Brian and Megan Kilgore (Matthew), and Kaitlyn; one step-grandson, Jacob; her brother, Samuel (Eleanor) Novara of Niagara Falls, NY. Jeanette was preceded by her parents, her husband in 2013, and four sisters, Lucy Porreca, Antoinette Novara, Fannie Rotella Smeadala, and Teresa Rotella. To send flowers or a remembrance gift to the family of Jeanette C. Beney, please visit our Tribute Store. "Email Address" would like to share the life celebration of Jeanette C. Beney. Click on the "link" to go to share a favorite memory or leave a condolence message for the family.